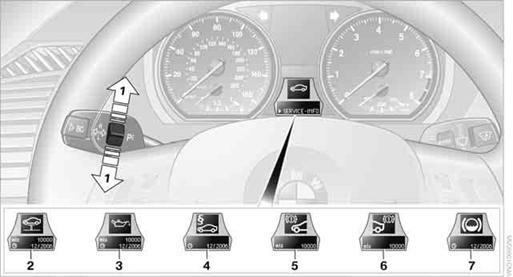 The remaining driving distance and the date of the next scheduled service are displayed briefly immediately after you start the engine or switch on the ignition. The extent of service work required can be read out from the remote control by your BMW Service Advisor. For certain maintenance operations, you can view the respective distance remaining or due date individually in the instrument cluster. 2. Push button 1in the turn signal/high beam lever up or down repeatedly until the appropriate symbol appears in the display, accompanied by the words "SERVICEINFO". 4. Use button 1to scroll through the individual service items. The sequence of displayed service items may vary. The data for the next service appointment is shown first. You can call up additional information on the maintenance regimen on the Control Display. Required maintenance procedures and legally mandated inspections are displayed. Select the entry and press the controller. Move the controller to the left. No service is currently required. The service deadline has already passed. Make sure the date on the Control Display is always set correctly, ; otherwise, the effectiveness of Condition Based Service CBS is not ensured. 5. Open the menu for entering the deadline. 8. Press the controller to apply the setting. 9. Turn the controller to make the adjustment. 10. Press the controller to apply the setting. The date entry is stored. System can be found on page 221. Data regarding the maintenance status or legally mandated inspections of the vehicle are automatically transmitted to your BMW center prior to a service due date. You can check when your BMW center was notified.